From global agreements to grassroots initiatives: a new book co-edited by UNU-EHS experts assesses the progress made in disaster risk reduction in Indonesia, and the challenges the country still faces. Reducing disaster risks and building resilience amongst communities and nations is essential if we are to achieve the Sustainable Development Goals (SDGs). And, given that it is currently ranked among the world’s countries with the highest risk of environmental hazards and climate change impacts, few places stand to gain more from a greater understanding of natural hazards and risks than Indonesia. In the years between 1900 and 2016, some 470 disaster events hit the country, causing close to 250,000 deaths and affecting more than 30 million people and causing US$29.5 billion worth of damage overall. The 2004 Indian Ocean earthquake and the tsunamis it triggered, killed 230,000 and left 650,000 without a home, with the vast majority of casualties and damage occurring within the province of Aceh, located in northwestern Indonesia. Moreover, allied with its geographic position within the center of the ring of fire and the juncture of earth tectonic plates, rapid population growth, increasingly high levels of urbanization and increasingly unequal economic growth means that Indonesia remains at heightened risk of natural hazards, including earthquakes and catastrophic floods. 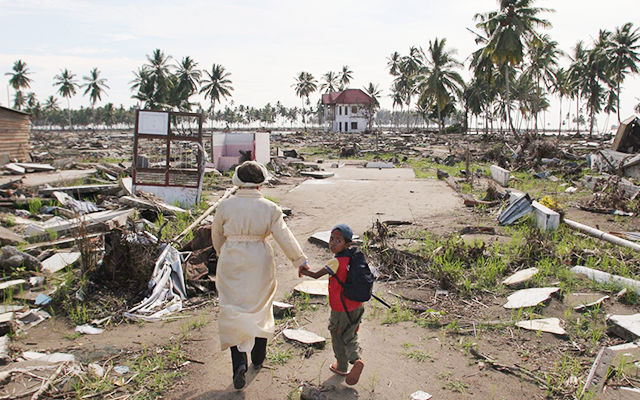 After bringing with it widespread destruction at a scale that the world had never experienced before , the Indian Ocean tsunami also marked a turning point in how the international community and national governments, including that of Indonesia, approach disaster risk reduction (DRR). Along with many other countries around the world, Indonesia adopted the Hyogo Framework for Action (HFA) in 2005 and more recently signed up to the Sendai Framework for Disaster Risk Reduction which, between now and 2030 will transform the global approach to disaster risk reduction and management, with the overall outcome of substantial reduction of disaster risk and losses. But it’s not just at the government-level where huge strides have been made towards ensuring Indonesia is better-prepared for to cope with any future disasters. The first key finding is that there has been the establishment of institutional and regulatory frameworks for DRR at the national and local level, marked through the adoption of the Law 24/2007 on Disaster Management and the formation of BNPB and BPBDs as the managing agency for DRR and DRM. Our research has found that actors on the local level are also playing a key role in enhancing resilience, from faith-based organisations serving to communicate the risks posed by natural hazards to their followers, to women’s collectives, like the one that helped households in the village of Salam, Yogyakarta, rebuild their livelihoods after disaster struck. We also need to highlight the part private enterprise, the media and of civil society have played and will continue to play in making Indonesia more resilient. In the Indonesian capital city of Jakarta for example, manufacturing firms have taken on a leading role in helping the city and the wider region be better-prepared for future flooding, while disabled people’s organisations have helped widen the scope of stakeholders, transforming this previously overlooked section of society into advocates for more inclusive disaster risk reduction policies. The new book ‘Disaster Risk Reduction in Indonesia: Progress, Challenges and Issues’, co-edited by myself and Dr. Matthias Garshagen, is the first collection of works specifically focused on disaster risk reduction in the country. The research that informed it, revealed the extent to which the increasingly complex nature of disaster risk reduction here – as with elsewhere in the world – needs to be faced with expanded tools and approaches, and by drawing on a wider range of stakeholders and actors. Now, over 12 years after the devastating tsunami, it is to be hoped that over the next 15 years, as the Sendai Framework is implemented, we can reduce the risk of disaster and the scale of potential losses and thereby make real progress towards achieving not only Sustainable Development Goal 11, to make cities and human settlements inclusive, safe, resilient and sustainable cities, but really all of the Global Goals.